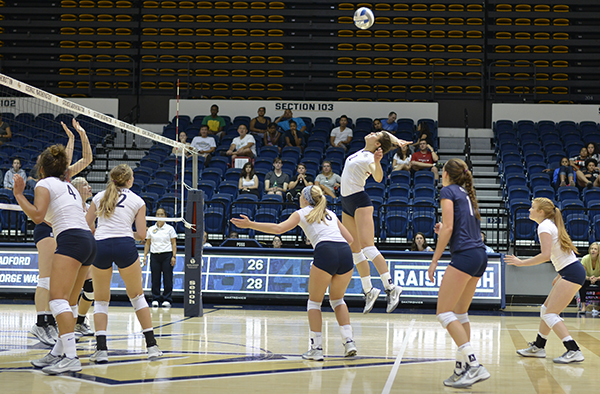 Rookie outside hitter Kelsey Clark goes up for a ball during GW's game against Radford on Sept. 5. Clark should help the Colonials get better production from the pins to take pressure off the team's middle blockers. Sussing out the identity of the volleyball team’s offense is an easy task. The team’s bruising attack is led by its two middle-blockers, Chidima Osuchukwu and Maggie Skjelbred. Osuchukwu is an All-American who can find the floor through opponents just as easily as she can around them, while Skjelbred is an un-fussable player who will make any defense who thinks the pressure is off when she is rotated in pay dearly for it. True. But they can’t do it alone. For the team to reach its goals this season, outside production will have to emerge as another strength for the Colonials to avoid being one-dimensional. After the team’s 2‒1 weekend at the Navy Invitational, Osuchukwu and Skjelbred account for 270 of the team’s 542 total kills. They’ve been the major producers, but outsides Kelsey Clark and Loren Williams both had productive weekends. Clark ranks second on the team with 107 kills and tied Osuchukwu for the match-high with 14 in GW’s 3‒1 win over Maryland on Saturday. Continuing to improve those numbers and getting consistency from those players will be critical for the team down the road. But it’s not entirely a case of needing improved performance. Sometimes, with the team’s strength at middle, the outside hitters will need to remember that they aren’t a supporting cast. Moor’s strong day Saturday included seven kills against Maryland and 10 against Texas Tech. The right side is important because the hitter lines up behind the setter, often making an attack from the right an unexpected surprise if the setter sets over her head. The element of surprise could be particularly valuable because Osuchukwu is getting more attention than ever before. She has regularly been drawing double and triple coverage, and still finding space. She’s improved the softer elements of her game from last season: Her ball placement has caught up to her sheer power, and she and setter Jordan Timmer have good communication that allows her to beat opponents to the point of attack if she gets up soon enough. But that still leaves Colonials open at the pins with a chance to do some damage. A handful of points were fumbled during GW’s win over Radford on Sept. 5, the last time the team played at home, because outside hitters were steps late to their sets, which could be due to a lack of anticipation that the ball would go to them. GW’s outsides, too, are younger than its middles. Timmer has had two years with Skjelbred and Osuchukwu to know exactly how high and at what time in their approach to the net they like their sets. Time will help her know those hot spots for other players. Osuchukwu and Skjelbred have given Timmer the majority of her assists thus far, but she’s clearly made an effort to spread the ball. She focuses on players who are locked in, Ault said, so if the outsides start finding the floor more regularly she’ll have even more reason to set them up. That strategy, of course, works best when “who’s hot” doesn’t always have the same answer. With some time to get on the same page, GW would be well-served if its outside hitters caught fire.